The sinking of the White Star Line’s new liner Titanic and the loss of an estimated 1,500 lives after striking an iceberg on its maiden voyage on April 15, 1912 has remained one of the world’s most memorable disasters. While there have been other ship disasters perhaps just as horrifying that claimed even more lives, the Titanic story is the one that remains etched most deeply in the historical record. And there are several strange synchronicities that we suspect account for this. In 1898 a book titled "Wreck of the Titan" by Morgan Robertson was published that predicted in almost graphic detail the Titanic disaster. Robertson even got the name of the doomed liner almost right. In the story the ship, which was declared "unsinkable" was an 800-foot-long giant carrying 2,500 passengers on a maiden voyage when it struck an iceberg on its starboard side and sank in the North Atlantic. More than half of the passengers died for lack of enough lifeboats. The Titanic disaster was almost a carbon copy of the Robertson story. 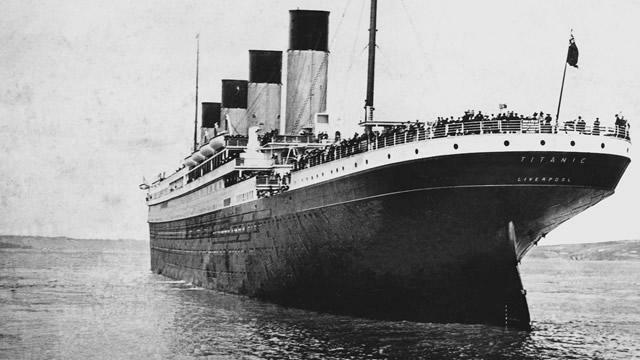 It measured 882 feet in length, was on its maiden voyage on the North Atlantic with 2,224 passengers plus 885 crew members when it struck an iceberg on its starboard side and sank. More than half of the people on the ship perished for lack of enough lifeboats. That the ruins of the Titanic have since been found and artifacts recovered for display in marine museums around the world; that various films have been made about the disaster, books and even songs written have helped keep the Titanic story alive in the human psyche. The loss of the Titanic and a collision that severely damaged a sister ship, The Olympic, probably caused a severe financial strain on the White Star Line. Both vessels were insured so there was some recovery. Nevertheless, White Star merged with its competitor, the Cunard Line, in 1934, during the heart of the Great Depression. A recent story in the Internet site Rise Earth suggested that the disaster also had a powerful long-range impact on the banking system in the United States and Europe because a few very wealthy and powerful businessmen perished with the Titanic. They included John Jacob Astor IV, considered the richest man in the world, Isa Strauss and Benjamin Guggenheim. According to the article, all three men were strongly opposed to a bill moving through the U.S. Congress that led to the creation of the Federal Reserve. Another heavy hitter, J. P. Morgan, who supported the concept of a Federal Reserve and who helped finance the Titanic, was slated to be on the voyage but cancelled at the last minute. The anonymous author of the brief Rise Earth story suggested that the destruction of the Titanic was carefully planned by Morgan to insure the creation of the Federal Reserve, which took control of U. S. currency out of the control of Congress and placed it into the hands of a board of powerful world bankers. It was on Christmas Eve in 1913, the year after the Titanic sank, that a key number of U.S. Congressmen met in special session in Washington, while the rest of the members were home for the holidays. There were just enough of them to pass the long disputed Federal Reserve Act. It was signed into law by President Woodrow Wilson, even though Wilson, a Democrat, ran for office on a promise that he opposed the act. He later said he was convinced that the plan for a Federal Reserve, as drafted by Senate Republican leader Nelson Aldrich during a secret meeting with bankers and high rollers on Jakyll Island, Georgia, in 1910, offered a better system of stabilizing the monetary system. Present at the meeting were Aldrich and executives for the banks of J. P. Morgan, Rockefeller and Kuhn, Loeb & Co. Paul Warburg of Kuhn, Loeb & Co. directed the proceedings and wrote the final draft of what became known as the Aldrich Plan. Col. Edward House, a banker present at the meeting, later was named a close adviser to President Wilson and was the founder of the Council on Foreign Relations. It was only about a decade later that the world collapsed into the Great Depression. The Reserve has been printing money on loan to the Federal Government ever since. The United States has since moved from having no national debt to facing a multi-trillion dollar deficit. Most of our tax money is paid each year in interest to the bankers who control the Federal Reserve. The U. S. dollar, once backed up by a gold reserve at Fort Knox, is now locked in run-away inflation. Was the Rise Earth story creditable? Was J. P. Morgan involved in murdering the opposition to the Federal Reserve by arranging the sinking of the Titanic? Did he get the idea from Robertson’s book? It is troublesome to note that Robertson, a noted author and former Great Lakes ship captain, was found dead in his hotel room in Atlantic City, New Jersey in 1915. He was poisoned from an overdose of paraldehyde. Robertson was only 53.